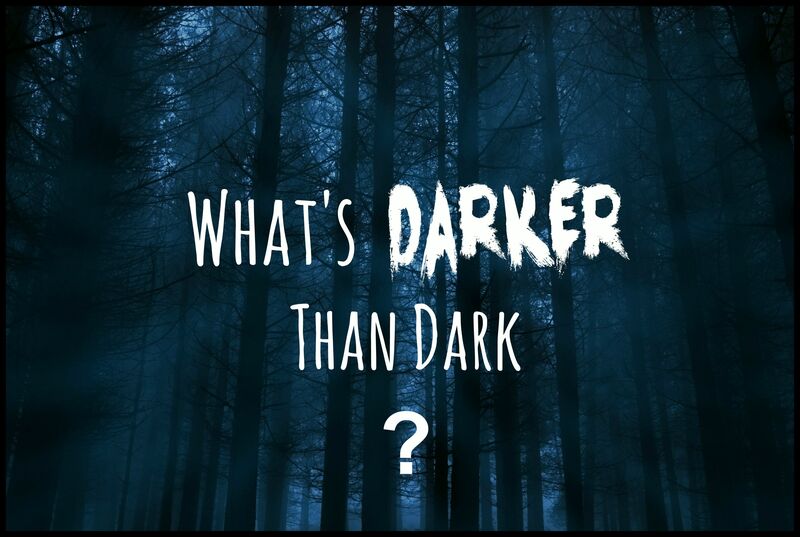 Home › Life in Christ › What’s Darker Than Dark? When I was a child I was afraid of the dark. One of my earliest memories is of waking to see a gigantic feral cat, silhouetted in the moonlight, filling the doorway to my bedroom. Yellow glowing eyes stared menacingly back at me as I contemplated what to do. Terrified, I did the best I could for a three year old: shouted for my dad and dived under the bed covers. From then on I was frightened of any dark places. Until I grew up that is. There’s a lot of darkness around, have you noticed? It seems each time we take a peek over that protective bed cover we call Christianity, spiritual darkness looms greater, staring back at us with its evil intentions, threatening to swallow us up, along with our loved ones and our familiar way of life. Wars and rumors of war spew from the nightly news; mass migrations of suffering humanity spill over national borders we once thought impenetrable; terrorists threaten us daily with unspeakable acts; values we thought sacred and beyond question are increasingly held to mockery and torn down in our courts of law. Death and destruction strike randomly and unexpectedly. Political leaders of all persuasions fail to meet our expectations and often seem on the side of the creeping darkness. It seems Christianity is under siege. We have two choices. We can hide back under the bed covers of our traditional religion, ‘tut tut’ our displeasure, and hope it will all go away. Or we can rise up as the militant victorious people we are meant to be, rebuking and driving back the darkness, waving our Bibles and our little white crosses with shouts of hallelujah and war to the death. Right? Of course, the other, less popular choice is that we can grow up….spiritually speaking. Jesus told us humanity would choose darkness, because in darkness mankind’s evil deeds can be hidden, at least for a while. Why then would we think we have a right to the luxury of offence? Broken heartedness? Yes. Offence? No. We have no mandate from Christ to claim the moral high ground, insisting that the world follow our rules. We have no entitlement to demand those in darkness act as if they live in Light. We have no right to religious, chest beating, passive-aggression against those who don’t recognize our way as the true way. We do not glorify Christ when we use worldly tools to dress up our arrogance and falsely label it as ‘love’ for the darkness dwellers. Because our citizenship is not in this world. We are aliens and travelers on this earth. Kingdom life cannot be wrapped in our country’s flag and claimed as our national heritage. To believe that it can is to walk not in Light, but in a false light that is even greater than the encroaching darkness (Matt. 6:23, Lk. 11:35). Jesus had some strong words for the two sons of thunder who determined to call down Heavenly fire on some people who were unwilling to receive Him. ‘You don’t know, (understand, recognize) the spirit that is motivating you’ He told them (paraphrase mine). That spirit was not the Holy Spirit, but the carnal and self-indulgent spirit of man (Luke 9:54-56). There are many kinds of zeal in the world; religious zeal is the worst and most destructive, whatever face it wears. It is evident that spiritual darkness is rising around us. What is not so evident is that a false light is also rising – a counterfeit Christianity that has its foundations firmly planted in carnality mixed with the political, religious and commercial systems of this world. It looks, sounds and acts like righteousness, but it is a counterfeit fruit of the Tree of the Knowledge of Good and Evil and opposed to the Tree of Life that is the true Christ. I shared elsewhere recently that it’s not the obvious rising darkness Christians need to fear. It is the less obvious false light that holds far more danger, for it has the power to deceive even the elect. I am convinced there is only one way to deal with the rising spiritual darkness escalating on this sad and broken planet. This is what Jesus did and it is the model He left us with. He was never offended at the darkness He found in mankind. He did not stand on the sidelines and rail at it. He walked amongst it – unafraid. He was Life and He was Light, and it is Light that consumes darkness, not darkness that swallows Light (Jn. 1:4-5). As long as Jesus Christ walked in this fallen world He was its only Light. That Light is now encased in the ones He called ‘children of the Light’, those who are of Him and in Him (Jn. 12:36). There is only one thing in all creation that spiritual darkness fears: the Light that is Christ. There is only one thing on this earth that is unassailable by dark spiritual forces: the Light of Christ in His own. You and I, as long as we abide in Christ, are the Light that overcomes darkness in this world. We don’t have to do anything to make that so: it simply is because Christ said it is. Come out from the covers, drop the ‘them and us’ attitude and find your corner in the darkness….with Jesus. Infiltrate and watch what He will do. Start today. The prisoners of darkness await. Acknowledgment: This post was inspired by three blogging friends whose words have impacted me deeply this past week (see below). Thankyou Charis, Nancy and Becky. Hi. Wonderful post. The church has to radiate the light of Jesus in a dark and increasingly darkening world,otherwise it is irrelevant. For a long time and in many churches that I have attended, there always seems to be an air of lamentation. Many concur that the world is wrong, without failing to point out that the world has never been right. The church is supposed to “light” the world, but the tragedy is that the church is getting dimmer and dimmer. Thank you for reminding us of our mandate as children of light and it begins with you and me. Thankyou for sharing your thoughts Lydia. It puzzles me how some blame the world for being wrong, when as you have so rightly shared “the world has never been right”. Ah Nancy, you have a way with words. And ditto back to you. “(Come on admit it, I had you going for a moment there, didn’t I? Just a little? )” Yes you did, I admit. I like this article and the way you use humor there. May every child of God let the Light shine in their corner of the world. Thank you Cheryl for your part in the illumination. Ha ha ha Patrick. Glad to see my little attempt at light heartedness caught at least one person. I absolutely agree “in ourselves, apart from Christ, the darkness means death”. There is only one Light, as there is only One who is Life. And darkness is defeated. Blessings to you Patrick! Cheryl, I love this. I love you. And I love the Christ that springs from the screen in these words. I have been thinking along similar lines in that it is not the darkness that we should be fearful of, rally against, or even focus on. There are wolves dressed in sheep’s clothing. There are angels of darkness parading as angels of light. This is evident with one glance into Christiandom. This, though, was my most favorite part: “This is what Jesus did and it is the model He left us with. He was never offended at the darkness He found in mankind. He did not stand on the sidelines and rail at it. He walked amongst it – unafraid. He was Life and He was Light, and it is Light that consumes darkness, not darkness that swallows Light (Jn. 1:4-5).” Yes. Amen. And hallelujah!! Such a helpful post, so biblical, accurate, relevant and hope-inspiring. Sometimes the darkness of animism, syncretism and ideology hangs dark over my part of the world. Many thanks Cheryl, Charis, Nancy & Becky! You are there for a reason Erroll. Keep shining! May every member of His glorious Bride join in singing “This little light of mine, I’m gonna let it shine”…”let it shine, let it shine, let it shine”.